There's lots of day hike opportunities in this 27,500 acre State Forest and a good hunk of the current Ice Age Trail. Many lakes and campgrounds dot the area, but traffic is high during the summer season. Wonderful geological features from the last great glacier. although interspersed with a lot of private land, there's plenty of room for hiking through this deciduous forest. Some backcountry campsites are available, and even the motor accessible campgrounds generally have a walk-in tenting area away from the crowds. Glacial Features: Kames, eskers, kettles, interlobate moraine. 29 miles of the Ice age National Scenic Trail. Recreation: Swimming boating, hiking, camping, picnicking, cross-country skiing. Highway Access: Fond du lac County Hwy. Y or V. 3 miles west of Campbellsport. This 115-mile drive follows the Kettle Moraine, a long ridge of forested hills that mark where two great arms of the last glacier butted up against each other. The route follows the Kettle Moraine Scenic Drive developed and maintained by the Kettle Moraine State Forest staff. Along the way you're likely to learn more about glacial geology than you ever thought you'd know. You will travel many unmarked back roads on this route (peek at the drive route numbers below), wandering all over hell and creation in search of yet more glacial formations to gawk at, and it is likely to fill an enjoyable day of driving. 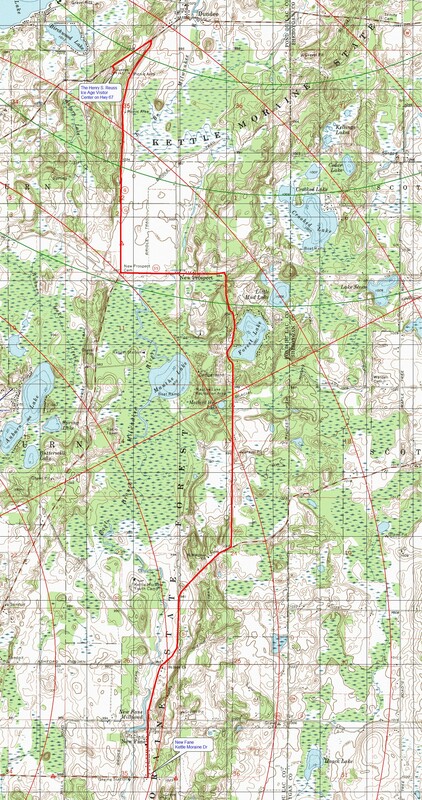 Kettle Moraine State Forest, glacial geology, hiking, biking, camping, cross-country skiing, fishing. Wisconsin Highways 23, 33, 59, 60, 67, 144, 167, U.S. Highway 45, Sheboygan County Highways A, F, G, S, U, V, SS, GGG, Jefferson County Highway H, Washington County Highways E and K, Waukesha County Highways C, E, G, K, GG, VV, Kettle Moraine Drive, Clover Valley Road, Engle Road. Mauthe Lake Recreation Area, Long Lake Recreation Area, Pine Woods Campground, Ottawa Lake Recreation Area, Whitewater Lake Recreation Area. Around twenty-five thousand years ago, the last great wave of the Ice Age glaciers was storming south from the Upper Peninsula of Michigan with a good head of steam (for a glacier) when it ran into Door County, north of the start of this drive. A glacier is fairly sensitive to the topography it runs up against, and when the last glacier hit the rocky peninsula we know as Door County, it split into two arms (called lobes by glaciologists), and each continued south. The Kettle Moraine (properly called an interlobate moraine) is the line of hills made up of piled-up glacial sediment that was deposited where these two lobes abutted, and contains some of the best examples of glacial landforms from the last Ice Age to be found in the world. It seems like many of the roads on this route wouldn't have been paved if the state forest hadn't developed the Kettle Moraine Scenic Drive route. Many of the intersections and roads are unmarked, so watch for the green Kettle Moraine Scenic Drive signs that mark most of the route. The drive begins at the intersection of Wisconsin Highway 23 and Sheboygan County A, in the town of Greenbush. From WI 23, turn south onto County A. You'll soon find the Wade House, which, when completed in 1853 by Sylvanus Wade, became the most important stagecoach stop on the plank road running from Sheboygan to Fond du Lac. The historical complex here includes a blacksmith shop where horses were shod and stages repaired, as well as the Butternut House, home to Wade's eldest daughter and son-in-law. At the stop sign with the Wade House on the right, turn right onto Plank Rd. One block later, turn left onto Center St, and then right after 2 blocks onto Washington St. After visiting the Wade House (note: the Wade House tours and visitors center is usually not open until mid-June) traveling East on Washington St. a short distance, turn right onto County T, after traveling approximately 6 tenth's of a mile bear left onto Kettle Moraine Dr. following the Kettle Moraine Scenic Drive signs. The road here is winding and narrow, and the trees close in on either side as you bump over the moraine. You'll pass the Greenbush Recreation Area and Greenbush Picnic Area (great spots for hiking and mountain biking) before you come to the second stop on this tour, Greenbush Kettle. The parking area for Greenbush Kettle is on the left, just past a sign that says "Shelter 5." Park and walk back along the entrance road to a trail and a wooden stairway leading down into a big hole in the earthGreenbush Kettle. Standing at the lip of the kettle, imagine being here ten thousand years ago, at the end of the Ice Age. The glacier has mostly retreated to north of here, and there is no hole before you, just a treeless space covered with sand and boulders. Beneath the sand at this spot is a huge piece of ice left behind in the glacier's retreat. As time passed, the ice melted and the land dropped, finally leaving this depression. You can best appreciate the immensity of the stranded ice chunk from the bottom of the stairs. Just past Greenbush Kettle, the road forks. Follow Kettle Moraine Scenic Drive to the right. At the stop sign and junction with Wisconsin Highway 67, turn left onto WI 67. Travel approximately 0.5 mile to County A and turn right. The mixed pine and hardwood forest here is dense, and the road rolls up and down through the moraine. At the junction with Sheboygan County U, turn right and travel approximately 0.25 mile to the parking area for Parnell Tower, a 50-foot observation tower built atop a high ridge of the moraine. The tower is about an eighth of a mile up the trail leading from the parking lot. The view from the tower is well worth the climb. To the west, in the distance, you'll see a series of bumps that rise above the relatively flat land around them. These are drumlins, glacial debris composed mainly of silt and clay with some small pebbles. The long axis of the drumlin is arranged in the direction of the ice's forward movement, roughly north-south here. Turn right onto County U out of the Parnell Tower parking area, travel just over 1 mile and turn left onto Woodside Road/Kettle Moraine Drive. After traveling 0.25 mile, turn left onto Shamrock Road; go 1 mile further and turn left onto the Scenic Drive. At the next stop sign you come to, turn right onto Sheboygan County V (though the road isn't marked at the intersection), and then after a short distance on County V, turn left (following the Kettle Moraine Scenic Drive sign) onto Butler Lake Road. The long sinuous ridge on the left side of the road is the Parnell Esker, one of the longer eskers in the state forest. Eskers mark the path of meltwater streams that flowed underneath the ice and consist of the glacial sediment deposited along the bed of the sub-glacial stream. At the stop sign, turn left onto Division Rd, and at the next stop sign and the junction with Sheboygan County F, turn right. At the next stop sign and the intersection with WI 67 in downtown Dundee, go forward, following WI 67 south. Dundee is home to the world-famous (among geology buffs, anyway) Dundee Kame, known locally as Dundee Mountain, a 250-foot pile of sand, pebbles, and boulders that formed at the bottom of a hole in the retreating glacier. Glacial meltwater streams running along the glacier's surface washed the debris into the hole, and the debris accumulated at the bottom of the hole. The perimeter of the base of the Kame will give you an idea of the size of the hole in the ice. For a good view of Dundee Kame and more glacial geology, head for the Henry S. Reuss Ice Age Visitor Center up a hill just outside of Dundee on WI 67. As you're headed up the hill, you'll notice that the Kettle Moraine Scenic Drive veers off to the left on Sheboygan County G. If you want to skip the interpretive center, follow it left here. Otherwise, continue up the hill to the top and turn left into the center's driveway. The center features a large mural depicting the surrounding area roughly ten to twelve thousand years ago, at the time of the glacier's final retreat. The center shows a twenty minute film, and signs outside the center interpret several glacial features visible nearby. When you leave the center, turn right onto WI 67 and then right again onto County G and the Kettle Moraine Scenic Drive route. After rolling through the forest a bit, the road drops down to run alongside a glacial outwash terrace. A restored prairie now covers the outwash terrace. The terrace formed when sand and gravel were washed by meltwater streams from the retreating glacier's surface and deposited here, forming this broad, flat plain. At the intersection with Sheboygan County SS, turn left and cross the outwash terrace. There is a wildlife viewing area on the left side of the road not far from the intersection. When you've crossed to the other side of the terrace, turn right onto Sheboygan County GGG. This paragraph is devoted entirely to directions to get you through an extremely poorly marked section of this route. Stay sharp. Here goes. When County GGG meets Sheboygan County S, turn right, and at the stop sign in New Fane, turn left onto Kettle Moraine Dr. After going forward through a couple of intersections, turn right at the T-intersection with Ridge Rd. (which was completely devoid of signs or markings when I was here). After a brief segment of Ridge Rd. a curve to the left becomes Kettle Moraine Dr. again. At the next stop sign at Newark Rd and Lighthouse Lane, turn right onto Lighthouse Lane and cross the Milwaukee River. At the stop sign across the river, go forward, and at the stop sign and intersection with County Highway D, turn right onto County Highway D westbound. After passing under Highway 45, you�ll go up a big hill, and at the top of the hill when Highway D banks right, turn left onto Kettle View Dr. Go forward at the next stop sign, and at the stop sign after that turn right onto Shuster Dr. If all is well, the next intersection you come to should be Glacier Drive, where you turn left. At the intersection with Wisconsin Highways 33 and 144. Follow WI 144 south. You have now left the North Unit of the Kettle Moraine State Forest. WI 144 runs along the top of the moraine, with wooded hills all around. At the stop sign in the town of Slinger, go forward. Turn right at the junction with Wisconsin Highway 60 onto WI 60 west (West Commerce Boulevard), and after approximately 2 miles turn left into Pike Lake State Park on Kettle Moraine Road. Pike Lake State Park has twenty-five well-spaced campsites, as well as hiking, biking, fishing, and swimming. The park office is on the left at the WI 60/Kettle Moraine Drive intersection, and Pike Lake is just over the hill on the right. Continue on Kettle Moraine Drive past the intersection with Washington County E, and at the intersection with Waterford Road, turn right. At the junction with Washington County K, turn left. On your left, just after you turn onto County K, is Holy Hill (a kame, actually), the highest point in the Kettle Moraine and the site of a Catholic monastery. An observation deck at the top of the hill provides spectacular views of the surrounding countryside. To get to Holy Hill, turn left onto WI 167 and follow it up the hill. Otherwise, keep headed south on County K, which, when it reaches the county line, changes (in name only) to Waukesha County E.
The next town you come to is Moonches, named for an Indian chief who lived near here. Just after Moonches, County E turns right at a stop sign. Follow it, and then at the intersection with Waukesha County VV, turn right. In the town of North Lake, turn left onto Wisconsin Highway 83 at the stop sign. At the intersection with Waukesha County K, turn right onto County K. After a few miles, turn left onto Waukesha County C. You'll cross over Wisconsin Highway 16 at Neshota, one of the far outposts of the Milwaukee metro area. Continue on County C to Delafield, home of the Fox Inn, once an important stopping point on the stagecoach route that ran between Madison and Milwaukee. In Delafield, turn right onto Wells Street/County C, and you'll see the Fox Inn from the road. Outside of Delafield, County C crosses I-94, and on the left after you cross the interstate is Lapham Peak, birthplace of the National Weather Service. Increase A. Lapham, a conservationist and scientist who lived here in the 1800s (also winner of the Goofy Name Award and the peak's namesake), worked with the U.S. Army Signal Corps to set up a series of signal stations between Pike's Peak in Colorado and Lapham Peak to transmit weather data from west to east. Blue Mound State Park (Drive 19) west of Madison was the site of one of the stations. The meteorological data was transmitted to Lapham's office in Chicago, and Lapham then warned Great Lakes ports of impending storms. The view from the peak is excellent, showing sixteen of the surrounding lakes. At the stop sign after Lapham Peak, follow County C to the right. After approximately 1 mile, follow County C when it turns left. At the intersection with Waukesha County G, you'll cross what was once an important Indian trail running from Lake Koshkonong (west of Whitewater) to Milwaukee. Don't worry if you don't actually see the trail; it's not marked. Turn right here and follow County C.
At the intersection with Waukesha County D, cross County D and immediately turn left onto Town G/Waterville Road. At the fork in the road and the sign for County GG, bear right. At the next intersection turn right onto County ZZ, to enter the South Unit of the Kettle Moraine State Forest. At the junction with WI 67, turn left onto WI 67, and in a few miles you come to Eagle, where the first diamond found in Wisconsin was discovered in 1876. Eagle is also home to Old World Wisconsin, a collection of more than 50 historic farmhouses, barns, and merchant shops on 600 acres of wooded hills. If you'd like to see it, follow WI 67 approximately 3 miles south of town. If not, take Wisconsin Highway 59, the right-most road at the funky six-way intersection in Eagle. In Palmyra, approximately 6 miles out of Eagle, go forward onto Jefferson County H where WI 59 turns right. On your right, a short way down County H, you'll see cropland in a shallow valley. The land surrounding the valley is a glacial outwash plain, created when fine glacial particles were washed out of the glacier by running water. The valley itself is called a spillway, where a smaller meltwater stream cut through the already-deposited sandy plain. Turn right onto Kettle Moraine Drive, cross the spillway, and roll through the outwash plain. The wooded ridge on your right is the moraine you've been following this whole drive. On the left side of the road you can see (provided the corn isn't too high) the Elkhorn Recessional Moraine in the far distance. The glacier's progress, both advancing and retreating, was erratic; in the major advance of the last wave of glaciation from twenty-five thousand to fifteen thousand years ago, there were many retreats. This moraine marks the spot of a significant pause in the final retreat of the Lake Michigan Lobe of the glacier. Go forward at the next stop sign, and the stop sign after that, and you come to the Whitewater Recreation Area, with sixty-four campsites, a picnic area, a beach, and a boat landing. Drive 0.75 mile past the recreation area and turn right onto Clover Valley Road. At the intersection with Engle Road a mile later, turn right and travel 0.2 mile to the end of this drive, where there is a hand-dug artesian well that has been flowing steadily since 1895. The water is clear, clean, cold, and extremely refreshing for weary travelers on a hot day. To get back to civilization, travel back to Kettle Moraine Drive, turn right, and follow it to Wisconsin Highway 89. A right onto WI 89 will take you to Whitewater and U.S. Highway 12. DairySft and Internet Kmoraine are trademarks of DIMAN Systems . All other products mentioned are registered trademarks or trademarks of their respective companies. Questions or problems regarding this web site should be directed to Admin@kmoraine.com. Copyright � 1999 DIMAN Systems . All rights reserved. Last modified: Wednesday 07/09/2009 .